Light, sweet and refreshing. This salad tastes just as good as it looks! In a jar with a tight lid, combine the mayonnaise, yogurt, balsamic vinegar, milk, poppy seeds and honey. Shake well to combine. 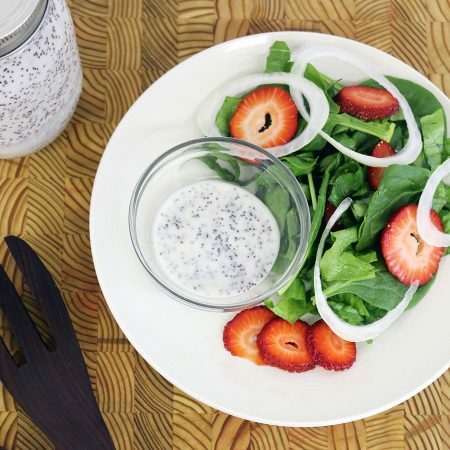 In a large salad bowl, combine spinach, romaine, strawberries, and onion. Pour dressing over salad and toss to coat evenly. Any type of vinegar can be substituted for the balsamic vinegar. Romaine can be cut in ribbons without lettuce browning. Store unwashed lettuce in a bag up to 10 days in the fridge. Rinse and dry romaine lettuce thoroughly on paper towels. Once dried, refrigerate in a plastic bag for use within 3-5 days.